One consequence of the Walking Pictures project has been people sending in scans, wanting to know where they were taken. And while I have 101 other things I ought to be doing, I can’t resist a challenge. 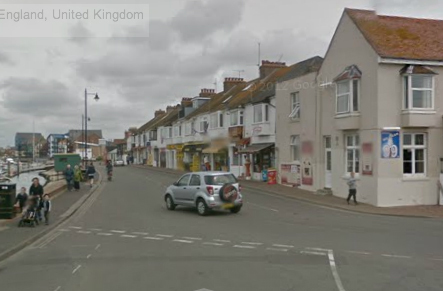 It’s as well Google don’t charge for their street view by the hour (but then given the tax they dodge, free is the least they can do!). This walkie by the firm of Sunny Snaps arrived recently, sent by Peter Aylett in California. It is very typical of their output, well composed and very naturalistic. It shows his father Jim on the right, looking very dapper in his pale suit, with an unknown friend (taken around mid-day in April.) Sunny Snaps have dated this one, 1939, but not given the location, and Peter was hoping we might be able to help. My initial thought was that this was unlikely to be a coastal Sunny Snaps walkie, but more likely to be back in London, their other main area of operation. The railway bridge was a clue, and the buildings very distinctive, but London has an awful lot of these. From what little I know of Sunny Snaps in the city, Fulham High Street seemed a good starting point, but while a rail bridge and church there matched quite well, the buildings were not quite right. Having trawled around on street view, I gave up and went in search of an Underground rail enthusiast site and discovered District Dave’s London Underground forum (http://districtdave.proboards.com/). Their moderator Rich kindly posted the scan and within a few hours John Tuthill had recognised the scene as Shepherd’s Bush Market station on Uxbridge Road in London. Many of the buildings have gone but he spotted the end of the Passmore Edwards library (now closed and replaced by a modern library, but hopefully opening as a theatre before long) just to the left of the fly postered telegraph pole. The bridge matches, but I could not see the church in the present day scene. John explained that the spire had been removed a few years later. The bus in the background is a new trolleybus, which had replaced the trams on this road only two years earlier. Peter has tracked the path Jim would have taken that day in 1939 from the family home on Astrop Terrace to the point where the Sunny Snaps was taken. 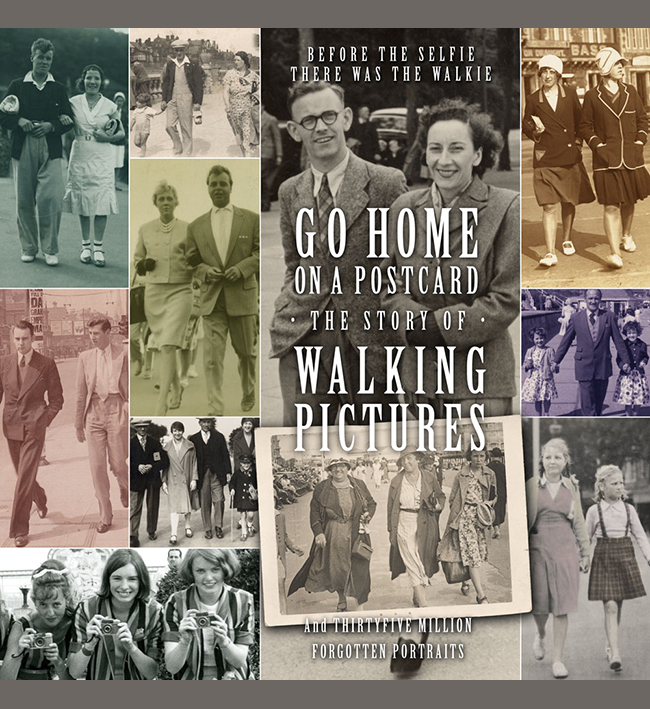 This is a useful addition to the story of Sunny Snaps, who we are beginning to think had a number of photographers out and about in London in the late Thirties as well as the South Coast towns. Quite often photographers worked near their base, and incredibly the yellow fronted shop in the modern view is currently a branch of … Snappy Snaps! 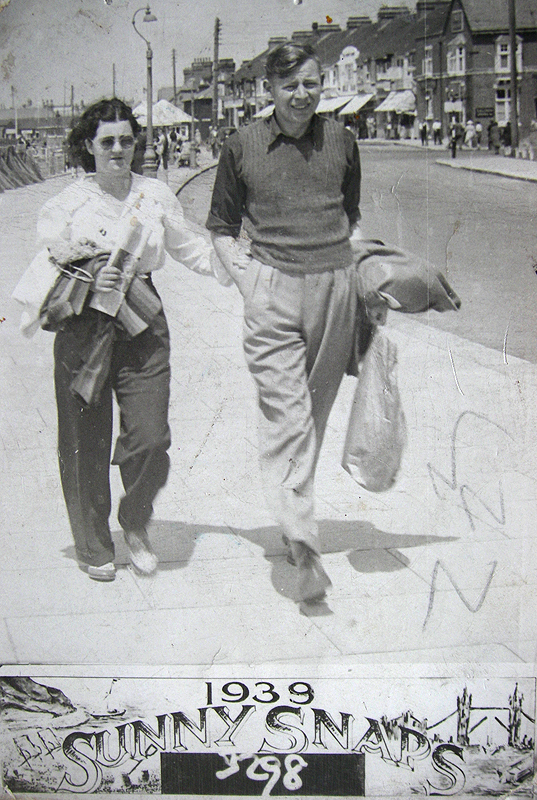 Our second example was taken the same year, and shows Johnny Smith’s Grandmother, again photographed in London, and looking smartly dressed for a shopping trip. 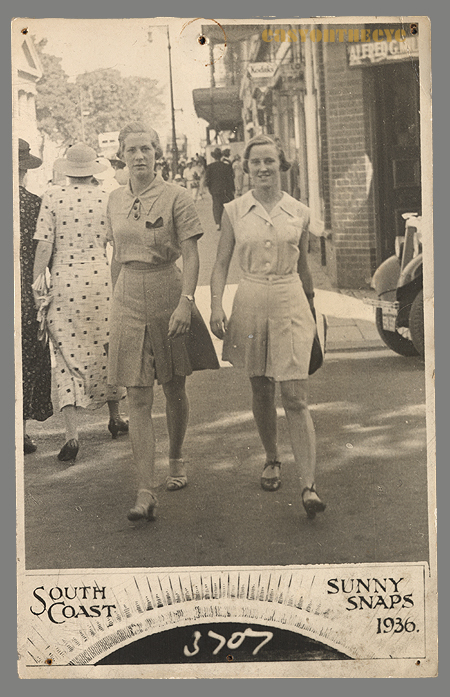 She lived on Battersea Rise near Clapham Junction in 1939 and this may have been taken on that road (or St. Johns Wood High Street which crosses it), which was (and still is) a busy shopping area, although I have not been able to make a match with the surviving streetscape yet. If anyone spots something they recognise, please let us know. That might be some sort of street market going on in the background. My thanks to Andrew Gordon for sending this unusual Sunny Snaps card in. I know it’s not a walkie, but the overall result with the colouring is so attractive I had to post it here. Colour photography had been developed but not for the mass market, so many seaside photography firms offered a colouring service at an extra charge. I’ve seen so few examples that I assume not many people went for the option. After all, the whole idea of such prints was that they were purchased (often on the same day they were taken) as souvenirs. Having to spend more and wait longer went against this concept. Most professionally hand coloured photos you see are more formal portraits, often weddings, and larger prints, where the extra expense was felt more justifiable. There was of course an alternative, DIY. 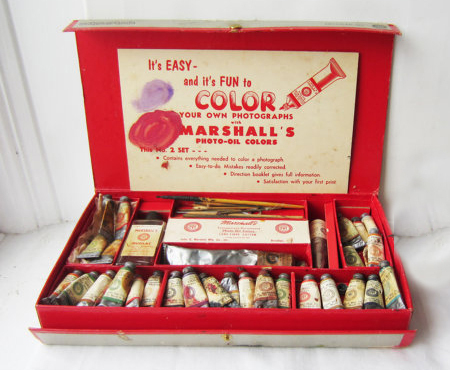 Firms offered sets of coloured paints which were formulated to work on photographic surfaces. These were oil based (normal water-colours wouldn’t dry properly) and applied using ordinary fine brushes. The results depended on the skill of the user! Here it appears one of the children in the photo was allowed to have a go, and they’ve not done too badly. As there is some evidence of paint drying in patches, they might not have had access to a proper set of hand tinting paint, but the overall result is very evocative. 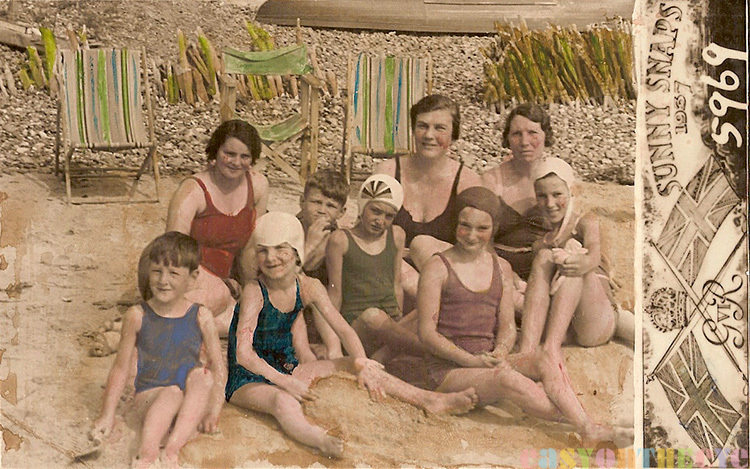 The usual Sunny Snaps type panel gives the date 1937, and Andrew says it was taken at at Elmer Sands in West Sussex (which is close to Bognor Regis.) It shows Mrs. Margaret Gordon, Mrs. Galder and Mrs. Nelson-Wright with their children. You can read more about Sunny Snaps on the site. The story of Snaps walking pictures (and a photo of the building) is on the site here. The scene looked familiar and I found another Sunny Snaps shot from 1933 which was taken on the same spot, and was marked Littlehampton. I like a challenge and found the location at the southern end of Pier Road, looking north. The brick shop in the top right has now been rendered and painted but the roof lines and chimneys are still recognisable. 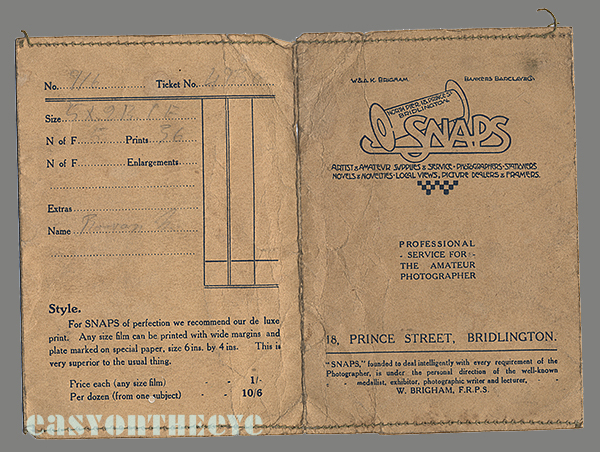 There is more information about Sunny Snaps on the site, it’s temping to think they must have had a shop in the row behind. Thanks to Peter for letting us show the image here. Grim or not, Wilks and Epps (nicknames it’s hard to decipher over seventy years later) obviously dropped by to see it on display and overcame what sounds like a slightly middle-class view of walkies enough to buy it, and others taken on the same holiday. I can just make out some signs for Kodak and Selo Films on the shop front behind them, so perhaps Sunny Snaps was operating from this location as well.